Fulbright Visiting Fellow, Department of Environmental Studies, University of San Francisco, USA, 2017-2018. Visiting Fellow, Department of Social Research, University of Helsinki, Finland, 2015-2016. Visiting Scientist, Department of Urban and Environmental Sociology, Helmholtz Centre for Environmental Research GmbH –UFZ/Germany, Summer 2013. Assistant Professor of Sociology, ABV-Indian Institute of Information Technology and Management Gwalior, 2009-2012. Senior Scientist, Department of Humanities and Social Sciences, IIT Delhi, 2009. Post-Doctoral Research Associate, Centre for Interdisciplinary Studies in Environment and Development (CISED) at Institute for Social and Economic Change, Bangalore, 2008-2009. Project Fellow, Media Lab Asia and Industrial Management and Engineering Department, Indian Institute of Technology Kanpur, 2007. Principal Investigator of Indian research group of “Climate Change Policy Networks (COMPON)” funded by National Science Foundation, USA. International PI is Professor Jeffery Broadbent, University of Minnesota, USA. Website: http://compon.org/ (Indian Budget: US$ 31,660.00), April 2014- March 2015. Principal Investigator of the project “Sociology of Social Network Sites: A Social Capital Approach to the Study of Young Adults of India” funded by Indian Council of Social Science Research, Ministry of HRD, Government of India (Budget: Rs. 5,69,750.00), 2011-2014. Co-researcher of “Contention or Consensus? Policy Networks of Climate Change in Finland in a Comparative Perspective with Sweden and India”, funded by KONE Foundation, Finland (Budget: €3,05,635.00), January 2014 to December 2018. Co-researcher of Climate Change and Civil Society (CLIC), funded by the Academy of Finland, Helsinki Research Group for Political Sociology, University of Helsinki, 2010-2013. Guest Scientist at Department of Urban and Environmental Sociology, Helmholtz Centre for Environmental Research GmbH –UFZ/ Leipzig / Germany, funded by German Research Foundation (DFG) (Budget: €5000), May-July 2013. Member of Socio-economic and Cultural group of a multidisciplinary project on Ganga River Basin Management Plan (GRBMP), funded by Ministry of Environment of Forest, Government of India 2011. Swarnakar, P., Zavestoski, S. and Pattnaik, B.K. (2017). Bottom-up Approaches in Governance and Adaptation for Sustainable Development: Case Studies from India and Bangladesh. New Delhi, India: SAGE Publications. Swarnakar, P., & Zavestoski, S. (2014) Special Issue on Environment and Technology: Mediating Factors toward Sustainable Development, International Journal of Innovation and Sustainable Development, Volume 8, No 4. 331-426. Kukkonen, A., Ylä-Anttila, T., Swarnakar, P., Broadbent, J., Lahsen, M., & Stoddart, M. C. (2018). International organizations, advocacy coalitions, and domestication of global norms: Debates on climate change in Canada, the US, Brazil, and India. Environmental Science & Policy, 81, 54-62. Ylä-Anttila, T., & Swarnakar, P. (2017) Crowding-in: How and why Indian civil society organizations mobilized on climate change. British Journal of Sociology, 68(2), 273-292. Swarnakar, P., Kumar, A., Tyagi, H. (2017) Network Dynamics in Friend Recommendation: A Study of Indian Engineering Students. International Journal of Information Technology and Management, 16(3), 287-300. Swarnakar, P., Kumar, A., Kumar, S. (2016) Why generation Y prefers online shopping: A study of young customers of India. International Journal of Business Forecasting and Marketing Intelligence, 2(3), 215-232. Swarnakar, P., Kumar, A., Wadhwa, M. (2016) Investigating preferred relationship through fuzzy sets in Facebook. International Journal of Web Based Communities, 12(2), 165-179. Ylä-Anttila, T., Swarnakar, P, Javed, S., Oivo, K. (2015). How to Avoid Seeing Like a State: Learning from CSOs. Economic and Political Weekly, 50(17), 14-16. Swarnakar, P., & Thahir, S. (2015). Acculturation of New Technology: The Business Success of Lee Kum Kee. Global Business Review, 16(1), 196-198. Swarnakar, P., & Sharma, A. K. (2009). Risk, awareness and response: An exploratory study of people’s attitude towards groundwater arsenic contamination in West Bengal, India, Eastern Anthropologist, 62(1), 61-83. Zavestoski, S. & Swarnakar, P. (2017) Governance for Sustainable Development in the Anthropocene. 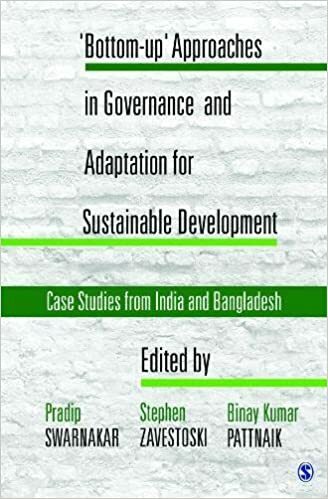 in Bottom-up Approaches in Governance and Adaptation for Sustainable Development: Case Studies from India and Bangladesh edited by P. Swarnakar, S. Zavestoski, & B. K. Pattnaik. SAGE Publications, New Delhi. Zavestoski, S. & Swarnakar, P. (2017) Neither ‘Top-down’ nor ‘Bottom-up’: A ‘Middle-out’ Alternative to Sustainable Development in Bottom-up Approaches in Governance and Adaptation for Sustainable Development: Case Studies from India and Bangladesh edited by P. Swarnakar, S. Zavestoski, & B. K. Pattnaik. SAGE Publications, New Delhi. Swarnakar, P., & Sharma, A. K. (2011). Environmental concern: Application of new environmental paradigm scale in Rural West Bengal in Migration, Health and Development, edited by S. Lahiri, B Paswan and K C Das, Rawat Publications, New Delhi/Jaipur. pp 170-201. Swarnakar, P. (2010).Who needs conservation and from whom? Olive Ridley turtle conservation in Orissa seacoast”, in Global Environmental Issues: Empirical Evidences, Edited by B S Lal, Serial Publications, New Delhi. pp 69-77. Swarnakar, P., & Sharma, A. K. (2009). Understanding environmental crisis: Locating common grounds in principles and practices between deep and social ecologists in Understanding the Global Environment edited by Samir Dasgupta, Pearson Longman, New Delhi. pp 119-136. Talukdar, R. & Swarnakar, P. Civil Society and Climate Change Movement in India: A Critical Evaluation of Development-Environment Dialectic from Rio to Paris (Narratives of Climate Change Symposium, at the University of Newcastle, Australia, July 5-6, 2018. and XIX ISA World Congress of Sociology, Toronto, Canada, July 15-21, 2018). Zavestoski, S. & Swarnakar, P. Transition for Whom? a Socio-Political Class Analysis of the Sustainability Transition Literature (XIX ISA World Congress of Sociology, Toronto, Canada, July 15-21, 2018). Da Rimini, F., Goodman, J., Swarnakar, P. Mapping a Laggard: Climate Policy Networks in Australia (Annual Conference of the Society for Social Studies of Science, 4S, Sydney, Australia, August 29-September 1, 2018). Swarnakar, P. & Ylä-Anttila, T. Social Movement Organizations, Epistemic Communities or a “Third Sector”? the Divergent Roles of Indian Civil Society Organizations in Policy Networks of Climate Change, ISA Forum of Sociology, 10-14 July 2016, Vienna, Austria. Kukkonen, A. & Swarnakar, P. Climate Change Discourse Networks in the North and South: Comparing the US, Canada, Brazil and India, ISA Forum of Sociology, 10-14 July 2016, Vienna, Austria. Swarnakar, P., Gross, M., & Bleicher, A. (2014). Trust me if you can: trust as strategic tool for decision making to deal with ignorance and uncertainty in contaminated sites of Germany and India. ISA World Congress of Sociology, 13-19 July 2014, Yokohama, Japan. Swarnakar, P., Pellissery, S., & Broadbent, J. (2014). Locating the media discourse of climate change policy network in India during 2007-2010. Presented at ISA World Congress of Sociology, 13-19 July 2014, Yokohama, Japan. Broadbent, J., Swarnakar, P., Jin, J. (2014). Comparing Climate Change Discourse Coalitions: Brazil, China and India in Comparative Context. ASA Annual Meeting, 16-19 August 2014, San Francisco, USA. Bhardwaj, N., Shukla, A., & Swarnakar, P. (2014). Users' Sentiment Analysis in Social Media Context using Natural Language Processing. In The International Conference on Digital Information, Networking, and Wireless Communications (DINWC2014) (pp. 103-111). The Society of Digital Information and Wireless Communication. Swarnakar, P. (2012). Locating climate controversies: Mapping climate change policy network in India during 2007-2010, Lund Conference on Earth System Governance, 18-20 April 2012, Lund, Sweden. Swarnakar, P. (2011). Risk, blame and trust: Social construction of groundwater arsenic contamination in West Bengal, India, German Environmental Sociological Summit, 16-18 November 2011, Goethe University Frankfurt (Main), Germany. Swarnakar, P. (2010). Does perception matter? Governing groundwater arsenic contamination in West Bengal, India, ISA 2010 World Congress of Sociology, 11-17 July 2010, Gothenburg, Sweden. Swarnakar, P. & Sharma, A. K. (2010). Measuring environmental awareness through new ecological paradigm model” presented at National Symposium on “Advances in Environmental Monitoring and Modelling, 13-15 May 2010, Department of Environmental Science & Engineering, IIT Kanpur. Swarnakar, P. (2008). Are we drinking poison? Understanding the notion of risk perception with reference to groundwater arsenic contamination in West Bengal state of India, Society for Risk Analysis (SRA) Annual Meeting, 7-10 December 2008, Boston, Massachusetts, USA. Swarnakar, P. & Chatterjee, J. (2007). Changing paradigm of craft cluster: Impact of societal change in the era of globalization”, 8th APSA Conference: Asia Pacific Region: Societies in Transformation, 19-22 November 2007, Penang, Malaysia. Swarnakar, P. & Sharma, A. K. (2007). Socio-ecology of domestic water consumption in India: A comparative study of scarcity and contamination regions, German Environmental Sociology Summit 007: International and Interdisciplinary Challenges, 8-10 November 2007, University of Lüneburg, Germany. Pattanaik, D, Swarnakar, P. & Chatterjee, J. (2007). Knowledge and innovation for global competitiveness and the business ecosystem model - a case study on Indian handicraft clusters, 4th International Conference on Knowledge Management (ICKM), 27-28 August 2007, Vienna, Austria. Fulbright-Nehru Academic and Professional Excellence Fellowship (Teaching and Research), Sep 2017-May 2018, United States-India Educational Foundation; hosted by University of San Francisco, USA. FinCEAL grant (€900) to attend the 6th Edition EU – India Science, Technology and Innovation Cooperation Days 2015- “Water for Health” organized in Rome, Italy, on 15-16 October 2015. KONE Foundation Senior Researcher grant for Visiting Fellow at Department of Social Research, University of Helsinki, Finland (Budget: €42000), June 2015- May 2016. German Research Foundation (DFG) grant for initiating bilateral research with Germany at Helmholtz Centre for Environmental Research GmbH –UFZ/ Leipzig / Germany (Budget: €5000), May-July 2013. Travel grant from Swedish Secretariat for Environmental Earth Systems Sciences (SSEESS) and Swedish International Development Cooperation Agency (SIDA), for presenting paper at Earth System Governance Conference, Lund, Sweden, 18-20 April 2012. Travel grant from International Sociological Association for attending 2010 World Congress of Sociology at, Gothenburg, Sweden, 11-17 July 2010. Travel grant from Society for Risk Analysis (SRA) for attending Society for Risk Analysis Annual Meeting, Boston, Massachusetts, USA, 7-10 December, 2008. Travel grant from ICSSR and ISA RC 24 for attending German Environmental Sociology Summit 007 at University of Lüneburg, Germany 2007. Travel grant from ‘Narayanmurty Benefit Fund’ of IIT Kanpur to attend international conference at Wisconsin Madison USA 2006. State Level Eligibility Test (SLET) for Lectureship by West Bengal College Service Commission, January 2002 and National Eligibility Test (NET) for Lectureship by UGC, December 2001. “Sustainability 3.0: Looking beyond top-down and bottom-up approach”, Humanities and Social Science Association Speaker Series, University of California Berkeley, March 26, 2018 (with S Zavestoski). “Actors, narratives and frames: Computational text analysis in climate change news reporting”, Computational Text Analysis Group, Barrows Hall 356B, University of California Berkeley, February 7, 2018. “Sustainability 3.0: Looking beyond top-down and bottom-up approach”, Sustainability Café, Lo Schiavo Science Center, University of San Francisco, California, November 16, 2017. “‘Bottom-up' approaches to sustainable development: Alternative perspectives from global South”, Global and Regional Studies, Galilio Hall, Saint Mary’s Colleage, California, November 8, 2017. “Crowding-in: How and why Indian civil society organizations mobilized on climate change”, University of Gothenburg, Department of Sociology and Work Science, 17 March 2016. “Sustainability Experimentation Venture Network (SEVeN): Nurturing local knowledge for global change”, Tervapääsky, Finnish Environment Institute (SYKE), Mechelinkatu, Helsinki 14 October 2015. “Comparing Climate Change Policy Networks: An Overview”, (with Tuomas Ylä-Anttila, Antti Gronow and Anna Kukkonen) Brown Bag seminar, Seminar Room 344, Unioninkatu 35, Faculty of Social Science, University of Helsinki, 15 October 2015. “Sociology of Contamination: Overview of past and present”, Department of Urban and Environmental Sociology, Helmholtz Centre for Environmental Research – UFZ, Leipzig, Germany, 17 June 2013. “Social Theories of Risk: A Critical Appraisal”, Public Lecture at Jamsetji Tata Centre for Disaster Management, Tata Institute of Social Sciences, Mumbai, 18 September 2008. Dr. Shukoor Tahir, 2014 (Post Doc), Dr. Sarvendra Yadav, 2013 (Post Doc), Katariina Oivo, 2013 (International intern from University of Helsinki). Coordinator of the workshop The Future of Sustainable Development in the Post-Paris World: Role of Community Based Organizations, 10 August 2017, ABV-IIITM Gwalior. Coordinator of international conference on Environment, Technology and Sustainable Development: Promises and Challenges in the 21st Century (ETSD2014), March 2-4, 2014, at ABV-IIITM, Madhya Pradesh, India. ETSD2014 (www.etsd2014.org) was organized by ABV-IIITM Gwalior (www.iiitm.ac.in) in association with Institute of Social and Economic Change, Bangalore, India (www.isec.ac.in) and College of Arts & Sciences, University of San Francisco, USA (www.usfca.edu/artsci). The conference was supported by Indian Council of Social Science Research, SAGE Publications, University of San Francisco and RC24 of ISA. Coordinator of Curriculum Design Workshop in Humanities and Social Science at ABV-IIITM, December 11-12, 2011. Dr. Swarnakar is trained as environmental sociologist specialized in climate change adaptation and policy, social network analysis and sustainability transition. He has obtained his doctoral degree from IIT Kanpur. He is an administrative board member of an international project group “Climate Change Policy Network (www.compon.org)” which deals with the climate policy of 20 countries. As an expert of social and discourse network analyst, he is instrumental in policy network data analysis of India, Finland, USA, Brazil and Australia. He has worked with a range of international scholars and published peer-reviewed article in Socius (A journal of American Sociological Association), British Journal of Sociology (A journal of British Sociological Association), Environmental Science and Policy, and Economic and Political Weekly. He has been a visiting scholar at the Department of Environmental Studies, University of San Francisco, USA, the Department of Social Research, University of Helsinki, Finland, and the Department of Urban and Environmental Sociology, Helmholtz Centre for Environmental Research GmbH-UFZ, Germany. He has been awarded prestigious Fulbright fellowship to study "Sociocultural dimension of drought management in the era of climate change: Lessons learned from California." He was also a recipient of KONE Foundation senior researcher grant and Deutsche Forschungsgemeinschaft bilateral grant. He is co-editor of the book Bottom-up Approaches in Governance and Adaptation for Sustainable Development: Case Studies from India and Bangladesh (SAGE Publications, 2017). Synergizing his expertise in environmental sociology and information technology, he is (with Prof. S Zavestoski from California) exploring the idea to create a global platform “Sustainability Experimentation Venture Network (SEVeN)”, (see https://sustainability7.net) highlighting the role of grassroots innovation and indigenous knowledge in climate change adaptation of the vulnerable communities.